Viewer-participants encounter a video projection on a wall. In the video is a stream which used to power a mill near my hometown long before I was born. Viewer-participants are encouraged to use chalk or charcoal to draw a mill on the wall in the video projection. 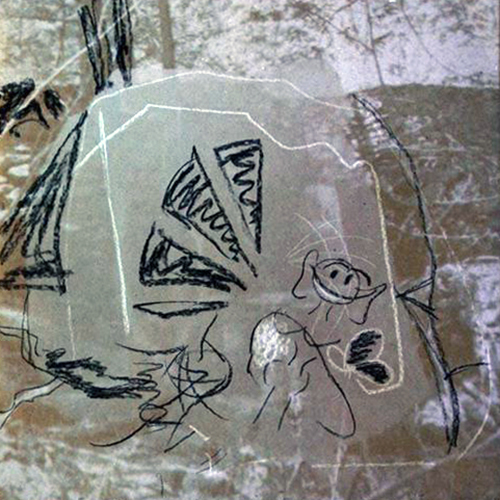 By drawing the viewer-participant grinds chalk and charcoal into dust, performing the original function of the mill, now used as a space for the presentation of art. The viewer/participant becomes the instrument. Typically, a mill grinds things into dust. Typically, a visual artist creates things to be looked at. Typically, a viewer looks. In Lovestad, the mill has become passive, like a typical viewer. If it were sentient, we could say it is bearing witness to the exhibition - like a typical viewer. These postcards from the Metropolitan Museum of Art in New York all reproduce works by American artists, which seemed appropriate missives to art-viewers in Sweden. I used sandpaper to turn a portion of the picture into dust ñ performing the function of a mill. I invite the viewer/participant to do the same. By sanding another portion of the postcard with the sandpaper provided, the viewer/participant becomes a mill/artist/viewer hybrid - grinding something into dust, creating something to be looked at, and looking at something. 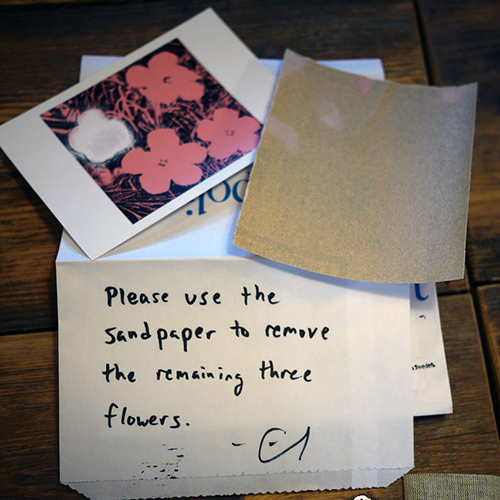 From two common objects (one postcard, one piece of sandpaper) the viewer/participant ends up with two original works of art (one uniquely altered postcard, one color-enhanced piece of sandpaper). No other ingredients (such as paint) are necessary - the only requirement is the viewer/participant's willingness to become an instrument of grinding, a mill.